A new paper published by Eyquem looks at the best ways to value a stock. The paper looks at the relationship between five different ratios and the past performance for each ratio for different types of stocks. The paper divides the total stock market into five different quintiles for price ratios including EV/EBITDA, EV/GP, P/E, P/B, and EV/FCF. EV/EBITDA – Enterprise value divided by earnings before interest, taxes, depreciation and amortization. This price ratio is most commonly used in private business valuation, and in public companies in leveraged buyouts. EV/GP – Enterprise value divided by gross profit. I haven’t seen this ratio used too often for stock selection. P/E – Price divided by earnings per share; one of the most common ratios. EV/FCF – Enterprise value divided by free cash flow. The results are pretty interesting. First, it shows the existence of a value premium, or the amount to which value stocks tend to outperform more expensive growth stocks over the long term. Secondly, it sheds statistical light into how investors should think about and analyze stocks. 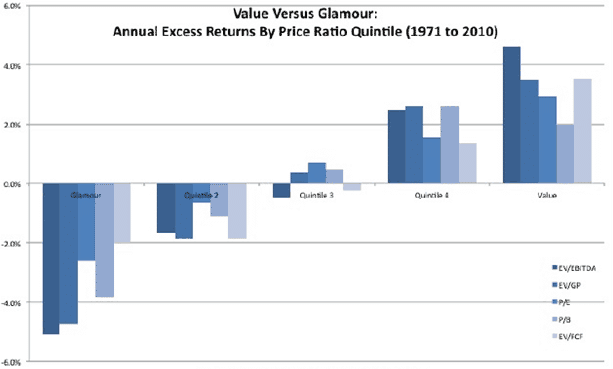 For high-growth companies in the “glamour” quintile, the best valuation metric seems to be EV/FCF. Most growth companies generate very little free cash flow due to growth expenditures, so those that can sustain a valuation common with growth stocks yet generate more free cash flow perform better. However, on the opposite end of the spectrum, value stocks with a low EV/EBITDA perform better than all other stocks. This is the worst ratio to use for “glamour” companies, however. In the middle, the simplest measure, price-to-earnings, performed better than all other valuation ratios. Valuing a company is more of an art than a science. You could put hundreds of analysts in a room to value a single stock, only to find that the values have a wide range from top to bottom. You certainly wouldn’t find a consensus for any given company. Individual investors have to play into Wall Street by using the valuation methodologies Wall Street likes most. Stocks will only go up in value if the market – everyone who is trading the stock – thinks it is worth more. For value stocks, private owners like to value companies based on EV/EBITDA most common in merger and acquisitions. In glamour stocks, it makes sense to focus on companies that can generate free cash flow – since so few actually do. Most glamour stocks grow and grow and grow until the company, industry or underlying business deteriorates. Think about early internet stocks that spent endlessly on growing online retail before Amazon eventually came out as the winner and beat out other new retail startups that burned free cash flow. Those results are interesting. The only one of those valuations I usually look at is the P/E. I probably need to start researching my stocks more. I thought it was interesting how each metric does a better job with different types of stocks.